This spring I made 10 splits. As of July, all 10 are queenright, each with a mated queen the workers raised themselves. 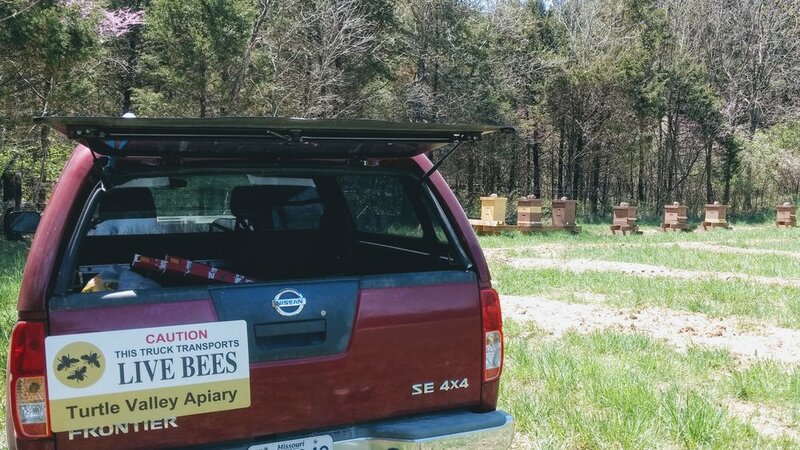 I'm always surprised at how strong the market is for new queens, and while there's definitely a legitimate need for queen suppliers, I suspect most requeening could be done by individual beekeepers without relying on outside help. I've never bought a queen. Each of my colonies has a queen that can be traced back to an original Carniolan mother bee from my first nuc. I prefer it this way because I don't get wild swings in the genetic disposition between colonies--I always know the source of the maternal genetics, and odds are my virgins mate with drones from my colonies too (not that I'm averse to some outside genetics being introduced too). If I only had access to overly-defensive genetics, I'd definitely be in the market to buy a queen; but as long as I like my stock of bees, I'll stick with raising my own. Below is the guide I made to help make timing decisions when I'm splitting each spring. If you're nervous about splitting or dealing with a queenless colony, follow these steps and most of the time you'll be successful. And once you're comfortable raising your own queens, you'll be a much more independent beekeeper. Mowing around new splits with a scythe. To split a hive, start with #1. For a queenless hive, start with #6-2. 1. Do the split in early April after the bees have a chance to build up their population, but before the main nectar flow. Ideally there are queen cells in the hive. 2. From the parent hive, transfer one frame of brood with attending bees, two frames of stores with attached bees, and two empty frames into a nuc. 3. Include the queen on the transferred frames*, plus shake a frame of bees into the nuc. So in total the nuc gets three built-out frames, four frames worth of bees, and the queen. *You must find and transfer the queen for effective swarm control. 4. The parent hive is left with five frames of brood and stores, but no queen. 5. The queen should begin to grow the nuc colony, and the parent colony is left with a majority of the resources to raise a new queen. 6-1. The parent colony will still likely produce a honey crop, and the nuc can be moved into a full hive after you have a laying queen. Now for the split, skip to step 7. 6-2. (Queenless hive only) Take a frame of eggs and/or very young larvae from a queenright colony and transfer it into the queenless hive. 7. Seven days after the split (or frame transfer) there should be capped queen cells in the parent hive. 8. Fourteen days after the split, if there are still no queen cells in the parent hive, consider moving a frame of eggs from the nuc to the parent so the queenless colony has queen-making material. 9. Wait a total of 28 days after the split to see if you’ve got a laying queen. 10. If not, check again 7 days later. 11-1. SPLITS: If the parent hive can’t successfully raise a queen, combine the nuc back into the hive. 11-2. RE-QUEENING: If the queenless hive can’t raise a queen, consider buying a queen or combining it with another colony. I seed my pasture with a lot of bee-friendly flowers each year. This year that included buckwheat, dutch white clover, yellow sweet clover, crimson clover, borage, white prairie clover, and more. With all of these blooming right now, the bees' preference is obvious--they love the yellow sweet clover. In fact, as long as the yellow sweet clover is in bloom, you're hard-pressed to find bees on the other flowers. This plant is a nitrogen fixer and was historically used extensively for hay, which is why it's a widespread "weed" now. If you've got a bit of land and you're looking to give your bees a source of nectar, consider putting yellow sweet clover down. I get mine from a local feed & seed store. It's surprisingly cheap, and pays you back in honey. I'm rarely the smartest guy in the room, so early on I had to find a way to compensate for my B-student brain. It turns out intellectual shortcomings can usually be overcome by good organization and hard work. In beekeeping, that means I carefully track, log, and plan my activities. If I just dove into my hives every week without forethought, it would waste my time and probably leave the bees in poor shape. In the photo above, I'm doing a mental manipulation of each hive before I actually crack any of them open. A few minutes before this, I was reading through notes in my log book to remind myself what's been happening for the last several weeks. A few hours before that, I was reading my white board (shown below). My white board is basically a visual aid to tell myself what's on the docket for each hive, and when I need to deal with them. It's hard to overstate how much of a crutch the white board is for me. You can pick them up for about $15, and then use Chartpak tape to create your columns and rows. Then--as long as you actively keep it updated--you'll be amazed at how much it simplifies your weekly planning. The last couple weeks I've done preemptive splits on my few remaining hives with two deep boxes. Last year I started moving to a single deep and a medium as my brood chamber. The idea is that the bees will still have plenty of space to lay and store food, but won't spend the entire June nectar flow filling every corner of 20 deep frames. Instead they'll start putting nectar into supers sooner, which means more honey during the flow window. At least that's the idea. And this winter, which was exceptionally long, they survived very well in this configuration. The one concern I have is whether this exacerbates swarming...but in my experience the bees get the urge to swarm in the spring no matter how much room they have in their hive. One of the things that makes honey bees great pollinators is that each bee tends to specialize in a particular food source. In other words, they will visit the same kind of flower over and over again. It's more efficient to learn how to get nectar or pollen from a certain flower, and then just keep working that flower until it's no longer productive. Under close inspection, you'd see that each flower is its own little puzzle, and the bees minimize the time spent unlocking the puzzles if they don't bounce from species to species. This is also good for the plants, because it means they're visited by bees that have often just come from another flower of the same species--vitally important when you rely on animal pollination for survival. Incidentally, it's a late year for foraging here in Missouri. Compared with bloom times from previous years, we're almost a month behind. I'm not complaining...it's comforting to have an unexpectedly long winter after so many unexpectedly early springs. In February I posted that I had signs of a skunk in the bee yard. In the same post I mentioned that the visitor could've been an opossum. At the risk of tooting my own horn, I was right. Twice. 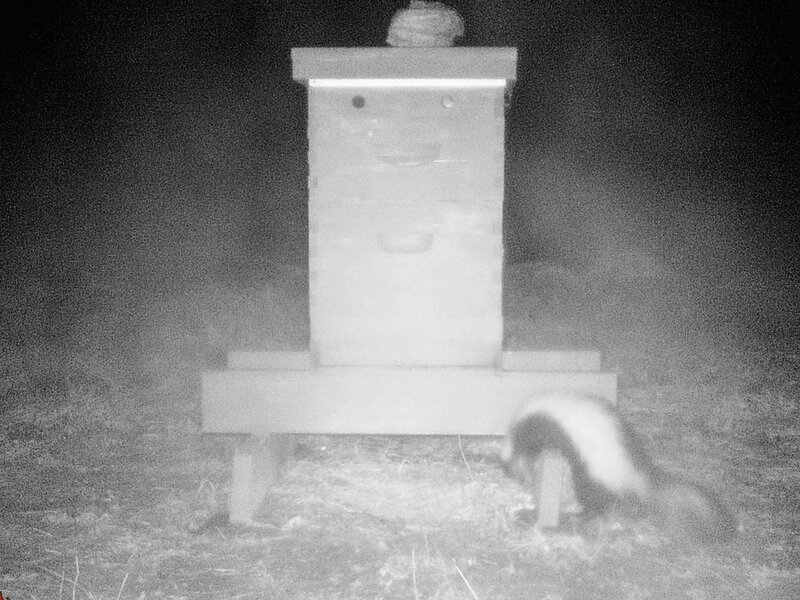 My hive camera shows I had a skunk and an opossum eating bees on several occasions in February. They tried to do some damage, as I sometimes found entrance reducers pushed off the hives; but at the time it was probably too cold for them to lure out live bees. So they were mostly left scavenging dead bees on the ground. I'm cool with that. But if they make a habit of eating my live bees, I'll deploy carpet tack to gently persuade them to find food elsewhere. Honey bees are not cold-weather flyers. Their muscles seize up if they get too cool. When this happens, the result is the stuff of nightmares--a bee may be alive and otherwise healthy while she lays on the cold ground unable to move herself to warmer climes. (Gen X'ers may recall Metallica's horrifying video for the song "One.") She'll ultimately succumb to the cold unless the weather quickly changes in her favor. 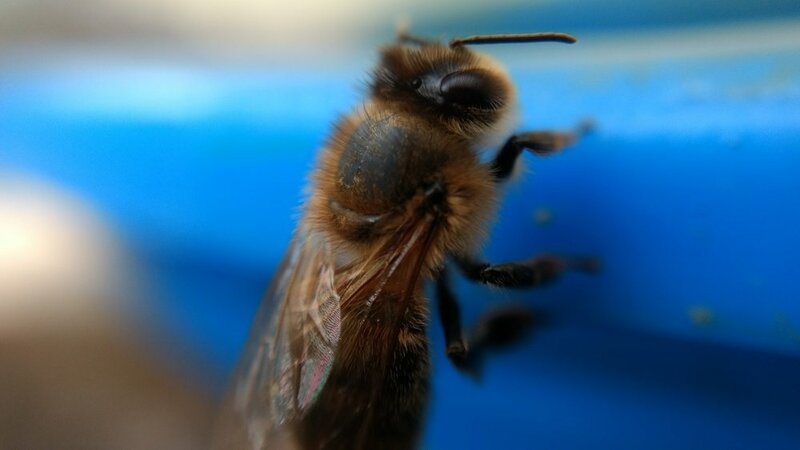 Beekeepers usually espouse 50° as the minimum temperature a bee will venture outside the hive, and that's not entirely untrue because 50° is the lowest temp in which a bee can fly for prolonged periods. But we've all seen bees flying on days when it wasn't 50° and wondered why they weren't following the rules we gave them. 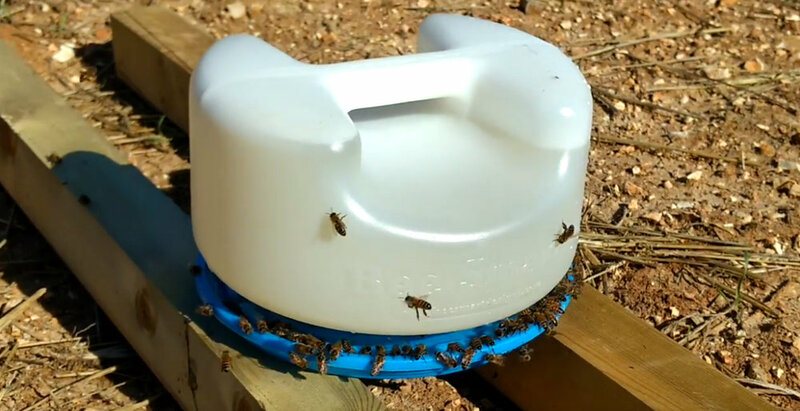 Enter an article in the January 2018 American Bee Journal titled "Cold Flying Foragers: Honey Bees in Scotland Seek Water in Winter." It's the most interesting bee-related article I've read for months, and it explains how bees thermoregulate their thorax temperatures to make flight under 50° possible (but only for short distances). I've spent so much time thinking about this new information that I decided to make it part of a beekeeping display at an upcoming festival. The picture above is the visual aid I made to spawn discussion with festival attendees. I hope you find as insightful and fascinating as I do. This worker bee was one of thousands gladly taking the syrup I offered on a warm day last week. If you look closely at her thorax (the middle section of her body), you can see how worn her hairs are. Her tattered hair reveals that she's a winter bee who made it through the coldest months and is now working to usher in a new generation. And it hasn't been an easy winter. She didn't have the luxury of hibernating or hiding away in a pupal state. No, with every degree it dropped, she shivered more to generate the warmth needed to keep her sisters--and her mother--alive. And now, with temperatures barely warm enough to sustain flight, she forages for nectar and pollen to feed the brood that's quickly taking over the comb in her hive. She will die soon, and the progeny she's worked so hard for will carry on. And they'll only live for about 4-6 weeks. This girl, however, has been alive for 6 months. In human terms, this is like some people living to 320 while the rest of us die at 75. Despite these seemingly impossible odds, she has survived just long enough to ensure her family sees another winter. As long as I don't screw it up for them.